The project site is located in an agriculture greenbelt south of Silicon Valley between San Martin and Gilroy. 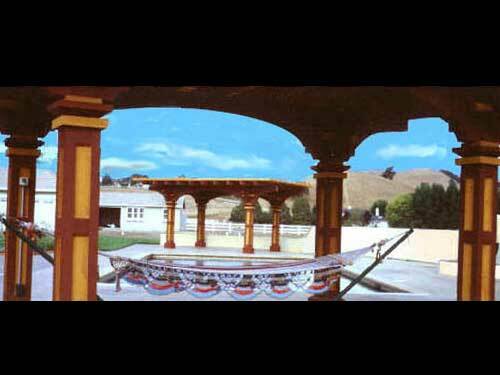 The setting is country-gentry living and the architectural style is neo-Spanish. The arbors are constructed entirely from rough-cut premium-grade cedar timbers imported from British Columbia, Canada supplied by Bear Creek Lumber. 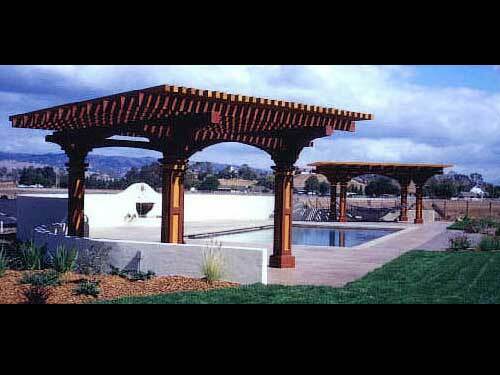 The project consists of two identical shade-structures at opposite ends of a large swimming-pool patio. 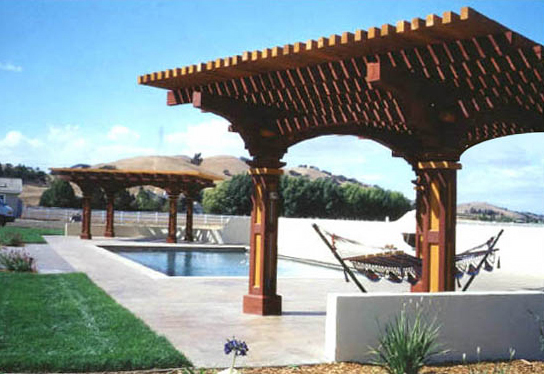 Both arbors are stained two-toned (transparent California Rustic and Canary) to highlight the natural wood-grain and amplify the details. At first glance the arbors' design appears to be one of those Stack-of-Stacks structures criticized in the Critiques. 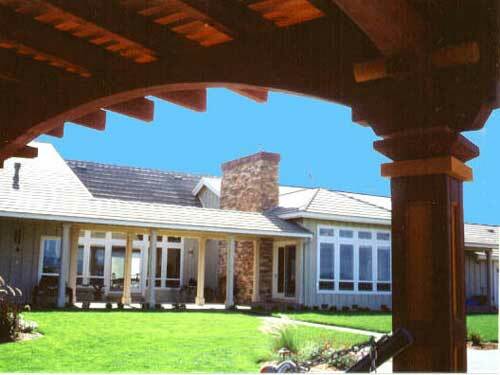 However, these arbors handle the columns and beams in an entirely different manner. The major beams are pierced by minor beams. Moreover, the minor beams are pierced by 3-inch diameter cedar lock-pins front and aft of each major beam. Both the major and minor beams are undercut with broad arches having a style popular in 18-th century Spanish architecture. The support columns are decorated with canary-stained recessed panels on all four faces. 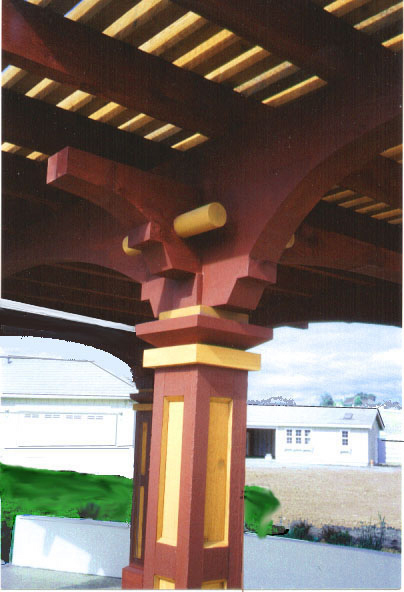 Each column is topped with a hefty capital and collar and anchored with a robust 10-inch-high base. All of these column elements were glued together with polysulfide caulk. The only fasteners even close to a nail were 1.5-inch pin-brads, used in the trim-strips just to keep the pieces in place until the caulk stiffened. The capitals, collars and bases are held together with just the caulk. 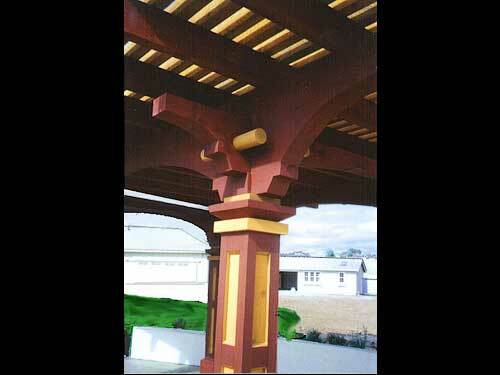 Not one nail was used in either arbor's fabrication, anywhere. Of course in the connections of column-to-beam, joist-to-beam and canopy's topmost lath, all the fasteners are zinc-plated bolts, ranging from 3/8-inch to 7/8-inch in diameter. 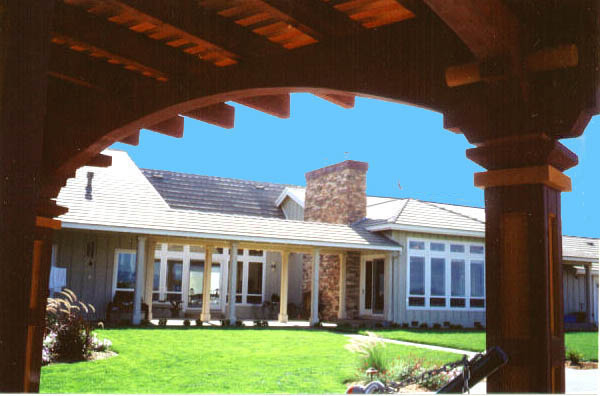 Yet as is customary with Mr.Deck's arbors, no screw, bracket or bolt is visible anywhere! 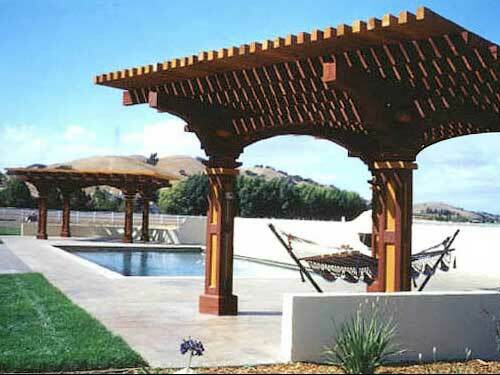 This rustic construction is quite a departure from our usual more finished arbor-style. It was designed with the owners' insistence that it be reminiscent of California's earlier days. In light of today's fast-paced work-styles in bustling Silicon Valley and the fact that a home in the country offers the ideal sanctuary, there was a serious interest in recapturing the look and feel of a more leisurely era. Swinging under one of these vast shade arbors in a large hammock with a warm breeze blowing across the valley is just the ready remedy the owners were seeking. What a great life!